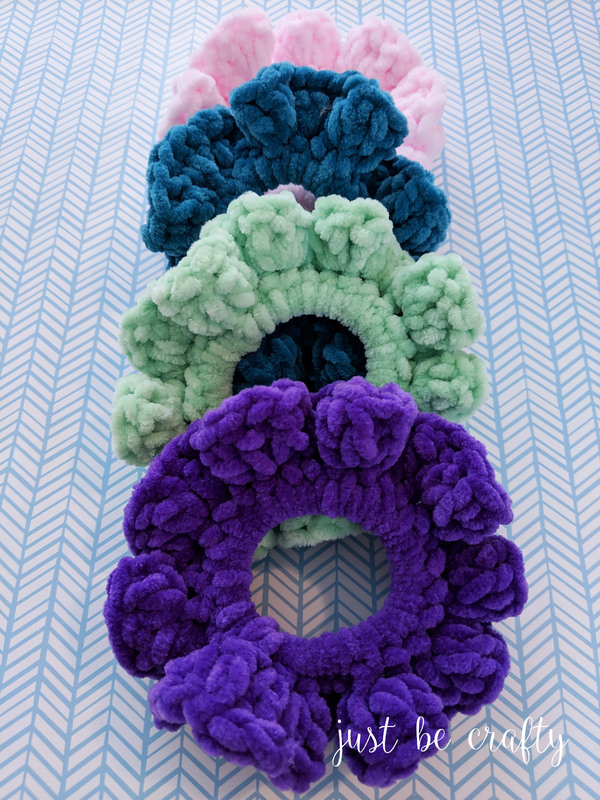 The 90s Inspired Velvet Scrunchies will be your newest crochet obsession! Bright colors, velvet yarn, side ponytails, high ponytails – does it get any better?! It sure does – you can whip these little suckers up in as little as 10 minutes! The dream of the 90s is alive everywhere! No matter where you go 90s inspired style, pop culture, and fashion seem to be dominating everything. Though not all 90s fashion and styles were wonderful but a favorite that I welcome back with open arms… scrunchies! 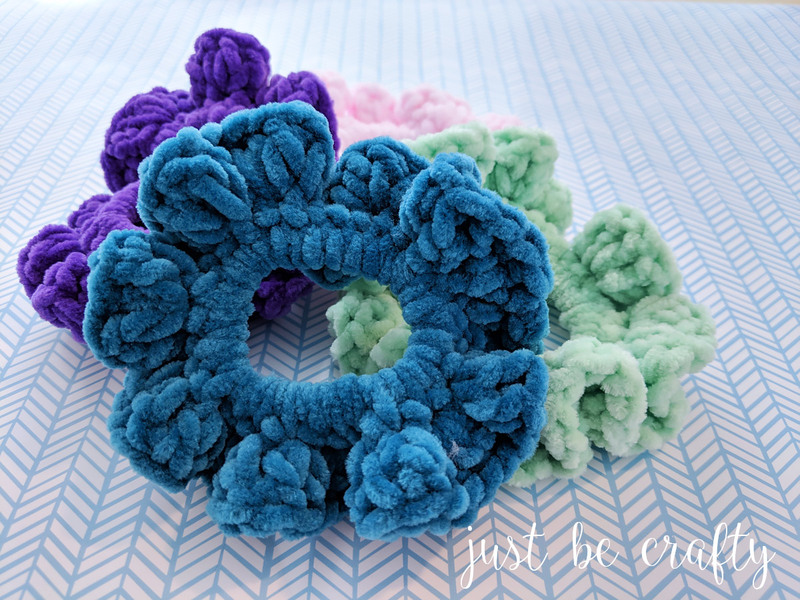 A few weeks back I treated myself to a pretty set of velvet scrunchies that came in assorted colors and prints and it got my creative juices flowing for an idea to make my own. On a recent trip to Walmart I found Premiere’s Parfait yarn, and I immediately knew what it was destined to be! The yarn is super velvety and comes in a variety of bright colors! 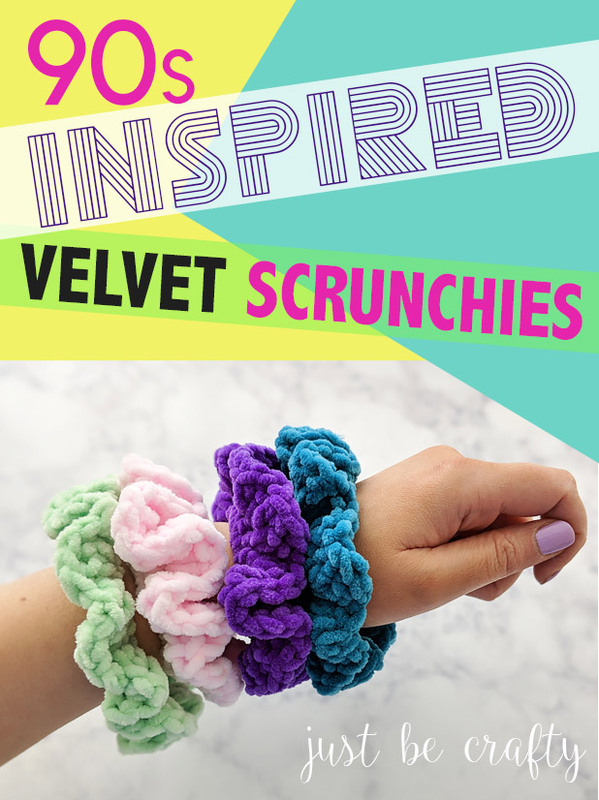 Thus, the 90s Inspired Velvet Scrunchies were born! This project is super fun and quick and the best part is that it can be whipped up in as little as 10-15 minutes. Because these little guys work up so fast, I suggest snagging multiple colors so that you can make yourself an entire set! Trust me – you will be addicted to making these! Speaking of the 90s and scrunchies, another one of my favorites that have made a comeback as of recent are Caboodles! I actually have an original “Kidz Caboodle” (probably circa 1995ish) that I use for holding random sewing items like pins, buttons, bobbins, thread, etc. Here it is below in all of it’s glory! It’s in pretty good shape! I have to admit that I almost bought a brand new one at Target last week to store my go-to makeup. I didn’t because it would have been a complete impulse buy – but I still keep thinking about it! 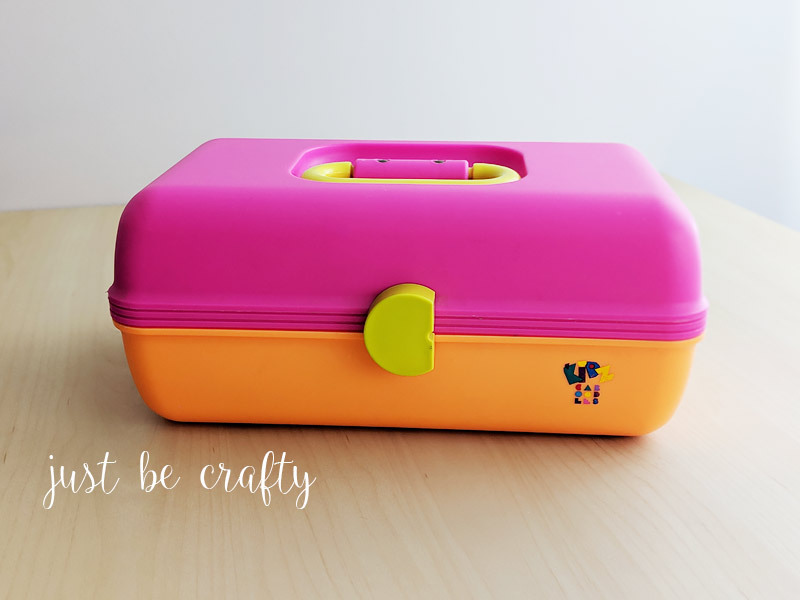 Do you have an old Caboodle in your life and/or have you purchased a new one!!?? Let me know in the comments below! 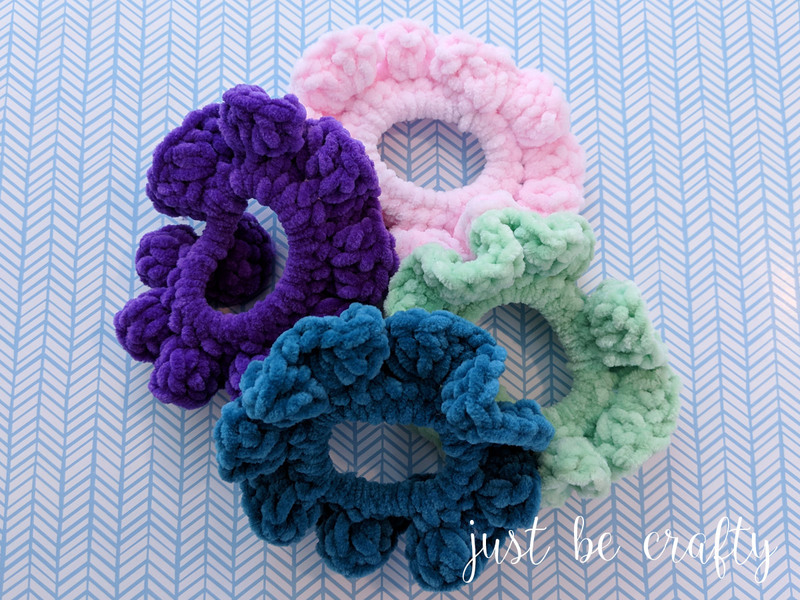 Ready to make your own 90s Inspired Velvet Scrunchies?! Let’s go ahead and jump into the pattern! 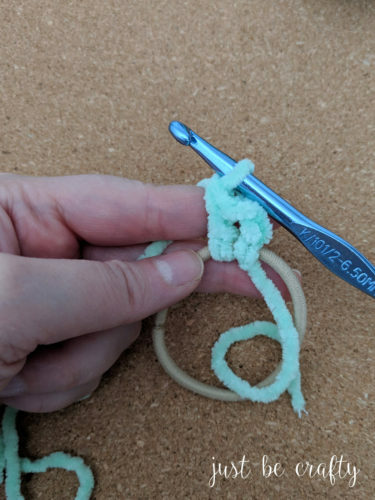 Note: Make a slip knot with your yarn, but do not place knot on hook yet! 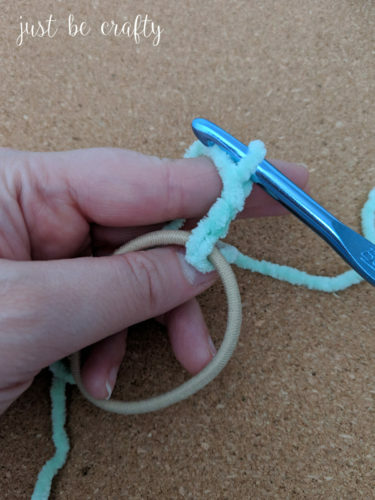 Using a standard elastic hair band, insert your hook through the hair band circle, place slip knot on hook and begin your first chain around the hair band. All double crochets in the first round will be made around the hair band. 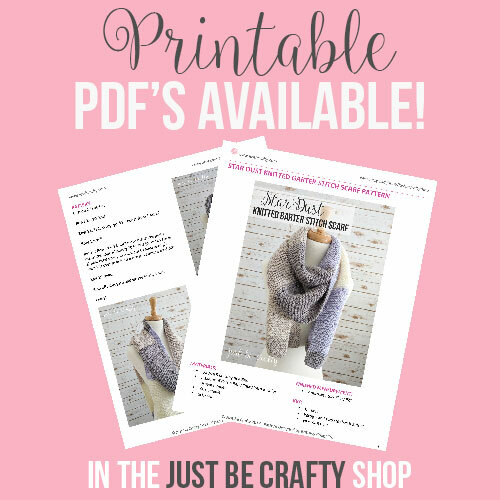 If you find that you need help getting started, see photos below the written pattern to help! 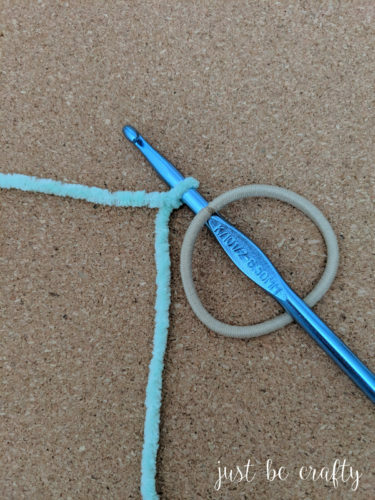 Round 1: Around the hair band, ch 3 (does not count as a stitch), loosely make 30 dc’s around the band (or enough to cover the elastic band in a single layer); join with 1st st of the round using a sl st. Round 2: Ch 3 (does not count as a st), make 3 dc in each st around; join with 1st st of round using sl st. 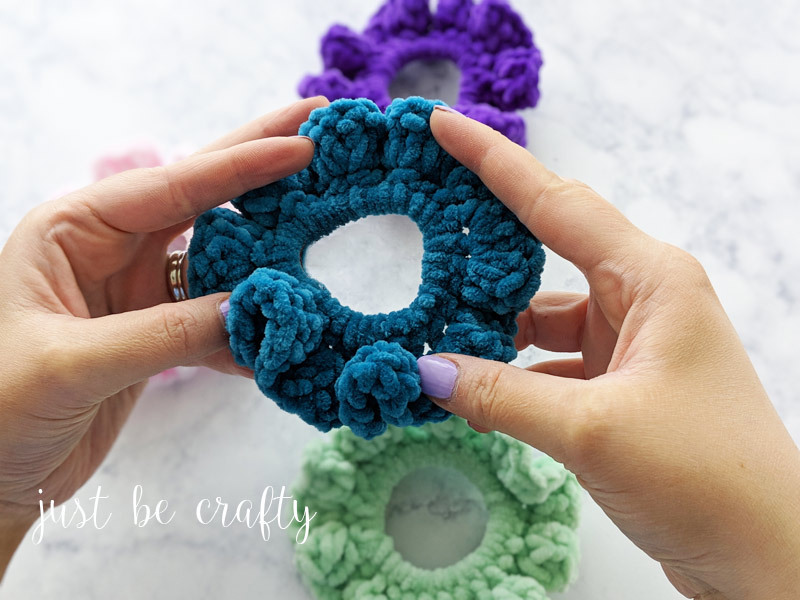 Step 1: Make a slip knot with your yarn. Using a standard elastic hair band, insert your hook through the hair band circle, place slip knot on hook. Step 2: Around the hair band, chain 3. Step 4: Ch 3, make 3 dc in each st around; join with 1st st of round using a sl st. I was looking for this type of pattern! So making some. Love this! My Daughter Zoey Needs these for her hair! Hi Aaron! Thanks for stopping by and saying hi! I’d love to see how they’d turn out haha! !